Metaphors are an inherent part of our daily life, both in our waking and sleeping states. We use them consciously to convey a feeling, description or situation. Unconsciously, during sleep, our dreams string together metaphors and symbols, some of which are easily attributable and others so obscure that they remain a mystery. Metaphor has played a significant part in therapy and self development for many years, contributing to Jungian therapy, NLP, Transpersonal Psychology, Psycho synthesis, and, for thousands of years, healing rituals and techniques. In recent years a new technique has been developed by therapists Penny Tompkins and James Lawley of The Developing Company, based on ground-breaking work initiated by trauma therapist, David Grove, two decades ago. Known as Symbolic Modelling, the process focuses on honouring and exploring a client's own metaphor using language which will have the least possible influence on the client's content. The technique fits smoothly into a coaching session and is particularly effective where a client seems stuck, or trapped in repeating behaviour patterns. By the use of metaphor, issues are tackled at a far deeper level than the conscious mind can reach, and changes in behaviour start immediately. Benefits can include increased confidence, reduced stress or depression and more clarity on the client's direction in life. The process is safe, easy to learn and a joy to experience. Being 100% client led, it is non-invasive and can be performed safely by relatively inexperienced practitioners. A common description of coaching is "holding up a mirror", where the coach enables the client to see themselves and their lives in a new perspective. This is often achieved by use of open questioning, clarifying and mirroring techniques. In a Symbolic Modelling session, the client will describe their issue as a metaphor. The practitioner then repeats the metaphor back, using the client's exact words, and asks a question of the metaphor, thus enabling the client to move forward as the metaphor evolves. This is the basis of Symbolic Modelling using Clean Language. Carl Jung's work made extensive use of metaphors and symbols, both through conscious visualisation and dreams. A symbol might then be taken from a client's dream and consciously developed during a session. Jung believed that the subconscious did not have words and communicated with the conscious mind through symbols. A symbol might be an object, a word, a living being or a scene. It is not uncommon to dream of someone we know, but find that in the dream they are behaving uncharacteristically, or portraying a relationship with us which is different to the relationship we have with that person in real life. This is the subconscious mind using the person as a symbol, in order to portray something that might be entirely different. For instance, a client had recurring dreams about the actor Alan Alder. She related it back to her emotional state during a relationship with a man called Alan Holder. Yet Alan Holder did not appear at all in the dream and the Alan Alder of the dream did not display any of his namesake's characteristics. At the end of her course of therapy, another patient dreamed of a new hairpiece being fitted onto her own hair. She interpreted it as the new self-knowledge she had gained through therapy being integrated to her old self. James Hillman worked through metaphor in what he termed the "imaginal world". The client might be asked to imagine a meadow or a house. Each client's meadow would be specific to them, and by exploring the meadow the client could develop at a deeper level than they could reach by real life exploration. Dreams and metaphors have been used for thousands of years to aid healing processes. Jung himself was an expert in diagnosing illnesses from the metaphors appearing in patients' dreams. More recently, many therapists are exploring techniques of healing through metaphor. The researchers Meredith Sabini and Valerie Hone Maffly have followed the dreams of cancer patients and observed how closely their dreams followed the course of their illness. Brandon Bays' "The Journey" reports extraordinary results in healing patients by metaphorically tracking what is happening in their bodies. Traditionally, working with metaphor involves the practitioner providing the symbols or helping to interpret the client's own representations. The Symbolic Modelling technique developed by Penny Tompkins and James Lawley enables clients to explore their own metaphors without interpretation or influence from the coach. A New Zealand therapist, David Grove, pioneered the technique while working with trauma victims during the 1980s. He discovered that the most effective way of freeing patients from the effects of their trauma was by asking the patient to describe their feelings in metaphor. Over a period of years, he identified questions that would least influence the client in their metaphorical journey, hence the term "Clean Language". The technique was witnessed by therapists Penny Tompkins and James Lawley, who devoted the next 3 years to modelling David's techniques into a methodology that could be taught to and practised by others. They organised David's original questions into a set of 12 which are reproduced in Diagram 1. Penny and James now run a growing client practice and training school and have generously reproduced a large body of their work on their website. 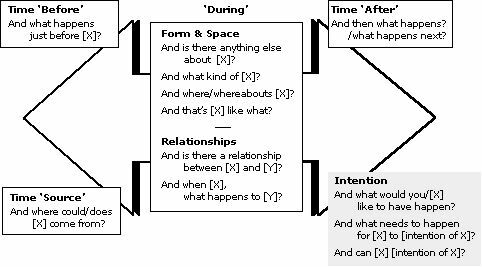 9 + 3 Basic CLEAN LANGUAGE QUESTIONS of DAVID GROVE DEVELOPING QUESTIONS ATTRIBUTES And is there anything else about (that) [x] ? And what kind of [x] (is that [x]) ? LOCATION And where/whereabouts is [x] ? METAPHOR And that's [x] like what? RELATIONSHIP And is there a relationship between [x] and [y] ? And when [x], what happens to [y] ? MOVING TIME QUESTIONS SEQUENCE And what happens just before [event x] ? And then what happens ? / And what happens next ? SOURCE And where could/does [x] come from ? _____________________________ INTENTION QUESTIONS And what would you/[x] like to have happen ? And what needs to happen for [x] to [intention of x] ? And can [x] [intention of x] ? The practitioner facilitates the client in identifying the client's own metaphors by using Clean Language to avoid contaminating the metaphors with the practitioner's own vision. "My fear is like green bile: it's everywhere -- on the walls, floors, ceiling." "Can you see a door you could go through to get out?" Here, the therapist is offering something from their own metaphoric landscape which may not correspond to the client's. There is a parallel in coaching where the coach must always be in the client's agenda, not the coach's own. "Is there anything else about green bile?" This allows the client to develop their own metaphorical landscape and reach a new level of understanding about their fear. As the session progresses, the client will usually come up with a device of their own creation to get them out, and it may not be a door. It could be a hand reaching in to help them, or a platform appearing. Very often the green bile type of metaphorical substance will become something more benign, for instance it might turn into molten gold, or clear water through which they can swim to safety. The technique works exceptionally well in removing blocks and breaking down repeating behaviour patterns. Previous forms of metaphor therapy, such as those developed by Jung, sometimes stop short of resolving an issue because the client is asked to interpret the metaphor. The trauma which is holding them back may be too unsettling for the conscious mind can face. Symbolic Modelling is effective in that the neither client nor practitioner ever attempts to interpret the symbols. The practitioner assists the client in watching the metaphor develop of its own accord to the point where it is resolved. The use of Clean Language honours and reinforces the client's own metaphorical landscape. The whole of the client's inner landscape is explored, including the position of the symbols in relation to the client. Sounds, signals and the body language of the client are taken into account. As the client focuses on the metaphor, it evolves, bringing about corresponding changes in the day to day life of the client. The first metaphor to appear may relate to a block or repeating behaviour pattern with which the client is struggling. As it is explored, new metaphors appear and each is explored in turn. As in coaching, a key starting question is "What would you like to have happen? ", shifting the focus towards a positive outcome. The subconscious mind does not have language: it communicates with the conscious mind through visions and symbols, and during sleep in dreams. Focusing on a metaphor enables the client to communicate directly with their subconscious. The repeating behaviour patterns that hold us back are often formed very early on in life -- even during time in the womb or during birth itself. Some behaviours are formed as a defence, and can persist for many years after the original threat has evaporated. During the process of Symbolic Modelling, the client does not have to identify the trauma in order to see it and move on. Fear and anxiety which have been carried for a life time can subside in one session when they are studied as metaphors. As the client describes the metaphor, it changes: new metaphors appear and are explored. Frequently, the client will describe something restricting or unpleasant in the metaphor, and will be able to see a different form or place they can move to which is far more pleasant. They may move directly to this place and stay there, in which case the deep seated problem is resolved, or they may find it impossible to stay in the good metaphor, and be tugged back into the bad. When the coach keeps the client focused on the metaphor, a device will often appear to enable them to make the transition. For example, the client may see themselves as seated on a horse on a merry-go-round, but the structure is not able to start moving. Eventually a key appears in the client's metaphorical landscape, then a hand which is able to turn it. The merry-go-round starts to move and the client can change. The structure of a session is illustrated in Diagram 2. The benefits are immediate. The client will start to feel different and to behave in new ways at once. The clarity attained is extraordinary and changes take place at the deepest level. Working with metaphor can bring about extraordinary change at soul level. The techniques which Penny Tompkins and James Lawley have developed, and continue to refine, have taken the practice to a new level in terms of personal change, performance and physical health. A client had a fear of public speaking. He regularly had to speak at events in the course of his business. He would always perform well at the event, but his anxiety would affect his work and relationships for a week beforehand. Using only Clean Language questions, and repeating his own words back to him, the coach helped him explore and develop the metaphor -- the equivalent of exploring the current reality in coaching. The following transcript of the session is not reproduced in full. Client: I get nervous for a week beforehand. Coach: And when you get nervous for a week beforehand, that's like what? Client: It's like the nauseous feeling before going on a rollercoaster at a fair. Coach: And when it's the nauseous feeling before going on a rollercoaster at a fair, what kind of nauseous is that? Client: It's being in one's shell, with the volume turned down. Coach: And is there anything else about being in one's shell with the volume turned down? Client: Dark shadow surrounding. Underwater, under the sea, pressure. The coach continued to explore the metaphor, using Clean Language questions, then asked: And what happens next? Client: I am seeing light at the surface, and sunshine. Then the coach introduced an intention question: And what needs to happen for the gravitational pull? Coach: And can the pressure turn? Coach: And what happens next? Client: The sun's coming out. Serene, relaxing and enjoyable. It feels great. I am on the surface and the sun is reflecting on water. All is quiet. The dull, quiet sound through the water has gone. The result for the client was that his customary week long anxiety did not trouble him again. In addition, he became less stressed in his life overall and found it easier to focus on taking his business forward. He continued to experience "butterflies" immediately prior to speaking, but felt that this was an essential part of performing well and did not require change. Book: Metaphors in Mind: Transformation through Symbolic Modelling"
Harry A Wilmer, Practical Jung: Nuts and bolts of Jungian psychotherapy (Chiron Publications, Wilmette 1987). Uses of visualisation in modern therapy: Freud, Jung, Leuner, DeSoille, Assagioli, Wolpe, Lazarus, Jacobs, Schultz and Luthe, Green and Green. © 2004, Carol Wilson and Fenman Ltd.
Carol Wilson is Honorary Vice President of the Association for Coaching and experienced the value of a coaching culture at first hand while working at board level for Richard Branson during the early years of Virgin. 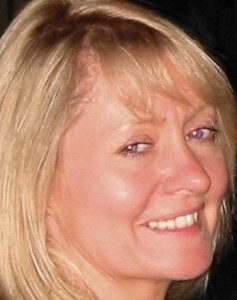 Since becoming a coach 5 years ago, Carol has trained or supervised the training of over 400 coaches in the public, corporate and private sectors, is a keynote speaker, broadcaster and writer, has written a guide to coaching called The Coaches' Handbook and was nominated for the AC Influence in Coaching Award 2004. Carol has incorporated David Grove's methods into her coaching work since 2002, and was invited last year to partner David in defining his techniques into a Clean Coaching methodology, see the articles written with David Grove. For further information visit: www.performancecoachtraining.com and www.cleancoaching.com or contact Carol on carolwilson@performancecoachtraining.com .